Do you struggle to hear the TV, or do family members complain the TV is too loud? Then perhaps TV Ears2 from first Street is the solution you are looking for. TV Ears 2 is a powerful new device that helps you to listen to the television at your own level while others may adjust the volume to fit theirs. With the new Television Audio Processing (TAP) TV Ears 2 dramatically enhances not only regular dialogue, but also brings hard to hear voices and whispers above the programs background noises so they’ll stand out. Boasting a maximum volume of 120dB – almost three times that of other headsets – TV Ears helps you hear every word clearly! In addition there are adjustable volume and tone controls that allow you to customize the output to match your hearing needs. The new version of TV Ears has been enhanced with new ear tips on the 2.3Mhz wireless headset that are made of self-forming foam that gently mold to the exact shape of your ear, providing greater comfort and enhanced sound quality. 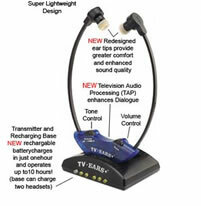 The transmitter base is capable of holding two headsets, and recharges a headset in just an hour. TV Ears 2 also boasts a new frequency that provides a clearer signal and will also work with plasma TV’s and fluorescent lighting! 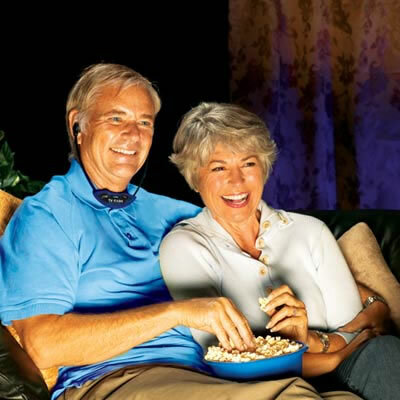 This means less interference when watching your favorite drama, comedy or news program.